This Los Angeles Jazz Band has performed from Las Vegas to Los Angeles, San Diego to New York and had many gigs & adventures in between. This band plays from 4 to 20 musicians, performing innovative arrangements of nostalgic music from the 1920’s to the 1960’s and original songs with a jazz, latin and Motown influence. 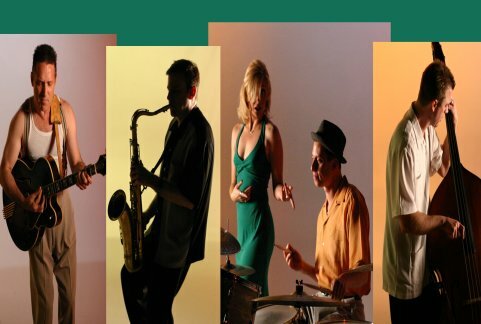 Big Lucky is fronted by the female singer and the arranger/saxophonist, with band members consisting of some of the finest touring and studio musicians in Los Angeles. 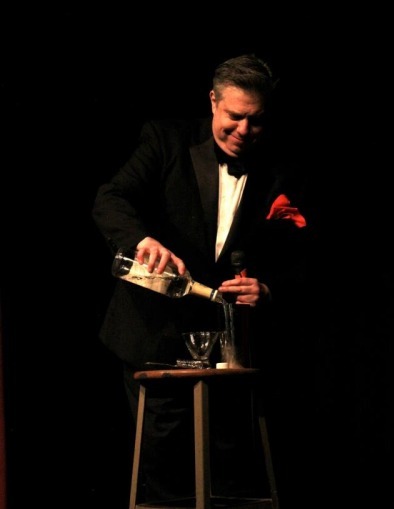 Exceptionally talented and entertaining. Their videos sold me, but they are even better in person. At the event, many guests asked me how I found this band. If life gets any better than these guys, you have probably died and made it to heaven…in which case, you can’t hire these guys anyhow. Seriously, all other bands that I looked at did not come close. Once I started working with this band, I ran out of time to pick the songs myself, so I had the band pick out the songs instead. They ended up blowing everyone’s socks off at the event, so I was pleased to have given them that leadership. But, I am sure they would pull off any of their songs just as beautifully. The BEST swing band in town. When my (now) wife and I were planning our 1940’s classic Oscars-themed wedding, we really wanted our event to evoke that time period. We scoured the web looking for the perfect swing band that could do just that. A lot of the bands we looked at weren’t quite as “hip” as we wanted. They were punctual, friendly and looked the part. We had a very complicated wedding set-up (four locations, four different instrument set-ups), and they handled the moves with a grace and professionalism rarely found in the music world. Our guests were raving. And I mean…RAVING. We had [this band] perform at our wedding at the Cicada Restaurant in Downtown LA. They could’t have fit so perfectly into the art deco building. All the guest could not stop talking about the band. They were very professional and organized, we meet with them before the wedding so they could create the song list to fit our 1920’s Jazz themed wedding. On the day of the wedding they were very accommodating to all requests. The band performed at our ceremony, cocktail hour and reception. They made our night so much more memorable. We would definitely recommend them for any event. – Tina K.
I booked this bang for my work Holiday Party. It was a complete success, from the beginning Valerie and Paul were very pleasant, quick to respond any questions or concern, and they listen to any suggestions we had. The night of the event everything was very organize the band looked great and they music was excellent. I could not have asked for a better band. Everyone had fun and the music sound great. – Maritza N.
We had [this band] for our wedding last month and they were fantastic. They have an amazing range of music and most importantly, are a real band with real musicians, not a cheesy wedding cover band. They are great to work with and flexible to our needs. (We booked them as an 8-piece). Paul, the band leader and Val, the singer comforted us with their attention to detail and experience during those last few days and weeks of planning. When we sought advice from them, their experience in past events came through, when we told them what we wanted for specific dances, reception entrance, etc, they did exactly as we asked. Val has great presence as the vocalist and acts as a perfect emcee. We got many complements from our guests on the band and they looked incredibly sharp (the band stands are a great touch). As music is extremely important to both my fiancee (I mean wife!) and I, our wedding band was somewhat of a source of stress. [They] delivered the goods and made our wedding truly memorable. HIGHLY RECOMMENDED. – Adrian G.
We hired [this band] to perform at our industry party at SirReel Studios in Burbank, Ca and were so glad that we did. Our party was a speakeasy style party and [their] swing music fit perfectly. We asked for seven performers and a sound tech to be present at our event. The sound tech arrived early with plenty of time to set up all the band’s sound equipment prior to guest arrival. He was friendly and kind to staff and guests alike. The band itself was amazing. The lead female singer knew how to get the crowds attention and the instrumentalists were top quality. We asked 3 of the horn players to play for an extra 40 min with our DJ to help the party transition into a dance scene. Without any rehearsals or prior walk-throughs with the DJ they were able to play along to whatever the DJ played, impromptu. They were amazing and everyone loved listening to them play. I would highly recommend [this band] and we would be happy to hire them again for a future party of a similar style. – Kiersten V.
The [band] played a big birthday party bash for us, and they were fantastic. Paul was very professional in understanding our ’40s theme and desire for an upbeat, fun cocktail party. We have gotten countless comments from our party-goers about how much they enjoyed the music. And, they added the Notre Dame Victory March to their repertoire, which made it for a perfect evening. Wonderful performance! 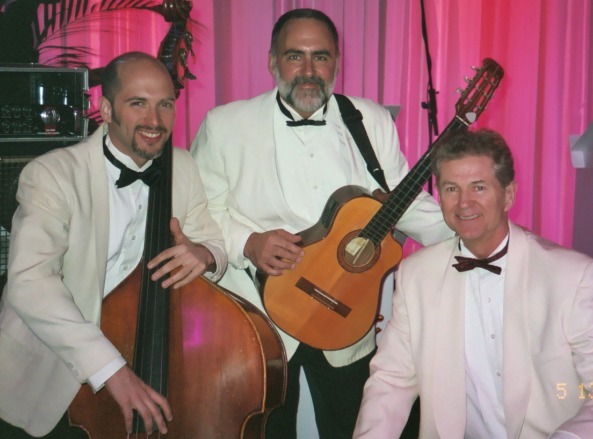 – Ryan K.
We decided to have a live band for our wedding day and thought that a swing band would be fun and add just the right feel to the evening. I came across [this band] in my search, and their promo video sold me pretty quickly, along with the great reviews from others. Val and Paul were extremely flexible, accommodating, personal and professional, and a pleasure to work with from beginning til end. We had a somewhat unusual venue space to work with, but they were extremely flexible in ensuring that the whole night went as smoothly as possible. Our guests loved them, but how could you not with Val’s voice against the quality musicianship of the band! They have a long song list to work with and are extremely helpful in helping make song decisions. I can’t recommend them enough and wish that I could watch them play again! – Emily S.